Grey day. But it's not raining and it's not humid. If you're reading this from anywhere in the UK that flooded I hope everything dries out again soon. Racing into Trouble is the second in Maggie Dana's Timber Ridge Riders series. The first book, Keeping Secrets, saw Kate McGregor arriving at the stables to be a companion to Holly, who has lost the use of her legs. Kate manages to overcome her crippling guilt over the death of a horse, and manages not only to ride again, but to do it successfully. Not only that, she builds a firm relationship with Holly and her mother Liz. This is all despite the machinations of Angela Dean, who loathes Kate. In an interview after her first book, Taking Flight, was published, Sheena Wilkinson said "Maybe I got the whole pony story thing out of my system with Taking Flight." 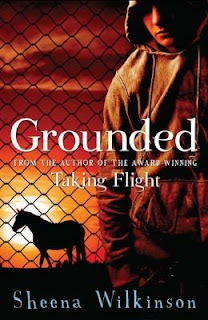 Fortunately not, as the sequel, Grounded, has now been published. Taking Flight was the story of two cousins; spoiled princess Vicky and out of control Declan. At the end of Taking Flight, Declan has discovered his love for horses, and despite his best attempts to ruin things for himself, has the offer of a job with the owner of the livery stables where Vicky's show jumper Flight is stabled. It looks as if everything is set fair for pony book success - Declan the show jumper; Declan the eventer.... an inspiring story of a tough working class boy made good. Very humid morning (not I'm sure when compared with some of you non-UK people out there, but a lot for those of us not used to it!) Makes a change to be bathed in sweat rather than rain. This dock leaf is the most extraordinarily vivid colour - like a piece of virulent and unattractive meat. I like the way the sheep arrange themselves - they're an instant pastoral painting. Sorry this is a day late - beautiful blue day yesterday. And the sheep are back! The 1950s had seen more pony books published than any other decade, but the 1960s were not far behind. It was in the 1960s that the paperback pony book really came into its own, after a rather slow start with Puffin Books, the children’s line of Penguin. Puffin printed Joanna Cannan’s Shetland pony story Hamish in 1944, as part of their Picture Puffin line, following it with classic cowboy-and-horse story Will James’ Smoky in 1945, which appeared in their usual paperback format. Pony books were a very small part of Puffin’s output. Puffin’s first editor, Eleanor Graham, produced very few: Kaye Webb, who took over as editor in 1961, was not a fan. Nevertheless, she recognised a quality story when she saw it, and in the 1960s published gems like William Corbin’s Horse in the House, Don Stanford’s The Horsemasters and Florence Hightower’s Dark Horse of Woodfield, as well as K M Peyton’s Flambards series. I'm sorry for posting no walk yesterday - last time it was that wet and I took the camera out it refused to work for the next week. It's drier today, but the vegetation is beaten down across the path and it's like wading through soggy, grasping stalks. It's not like, now I come to think of it. Wading through soggy grasping stalks is exactly what it is. The dog, who usually bounds ahead of me, refuses. I am there to clear her way through the drenching jungle, is her point of view. She will remain behind, and graze on soaking grass. Because that is what Labradors do. A lovely day. I don't know why the snail who had stowed away on my wellington thought it was a good idea. It was an awful lot wetter outside the porch. I was fairly wet by the time we got to this point, where the vegetation is beyond waist high. The dog left puffs of pollen behind her with every step she took. Beautiful, but awful if you are sensitive to grass pollen. It just seems daft to wear water proof trousers when the weather is so lovely. And at least you dry off quickly when it's so warm.